Samsung Galaxy Tab S4 has been in the news of late. It was first certified with model number SM-T835 in the Wi-Fi Alliance website earlier this month. Yesterday, it got certified in Bluetooth website with the same model number. SM-T835 is the LTE variant and SM-T830 is the Wi-Fi variant of the tablet. Now we have spotted a new listing for this tablet in the Geekbench website. As always, we can only confirm a few hardware specs from the listing. The tablet runs of Android 8.1 Oreo, has 4 GB RAM and is powered by Qualcomm octacore Snapdragon 835 chipset that clocks at 1.90 GHz. 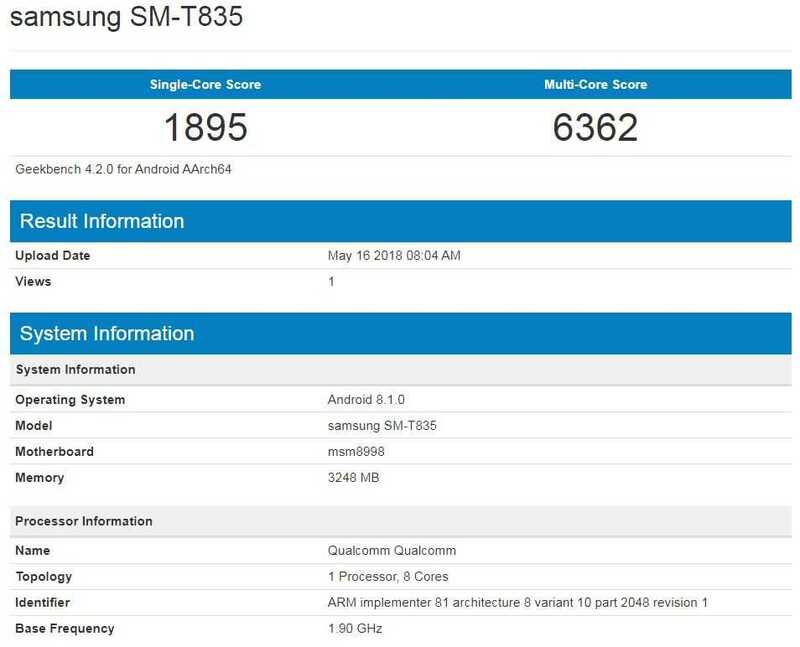 Few months ago, we had seen similar specifications for this device on a GFXBench listing and with similar numbers on Geekbench, we can officially confirm these specs. The other details obtained from GFXBench were 10.5 inch touch display with a resolution of 2560 x 1600 pixels, 64 GB internal storage capacity, 12MP rear camera and a 7MP front camera both of which support Full HD video recording. Last week, LTE version of the tablet with model number SM-T830 was spotted in the Eurasian Economic Commission’s website. And along with this model, there was another tablet in the same listing with model number SM-T590. Back in 2016, Samsung released a 10.1 inch tablet named Samsung Galaxy Tab A with model numbers SM-T580 and SM-T585. So going by the model numbers, this could be an upgraded 2018 version of Galaxy Tab A and may even have a bigger screen size at 10.5 inches. 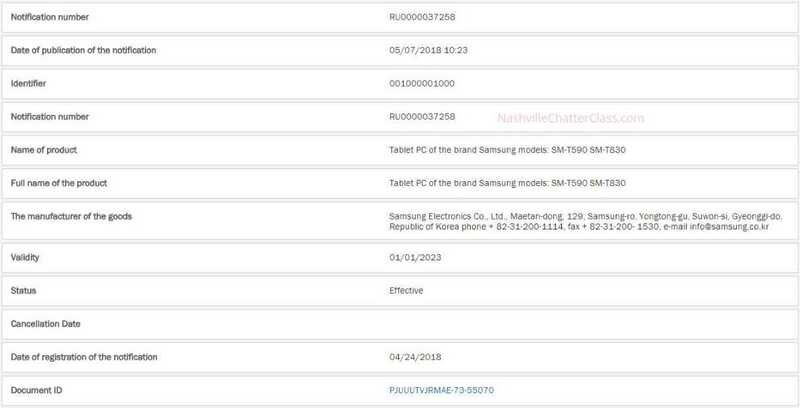 As of now, we have no other details about this tablet yet and the model number hasn’t shown up in any of the certification sites. Hence we have to wait for a few more days or weeks to know more about this tablet. However, the official launch of Samsung Galaxy Tab S4 can be expected in July as Samsung usually launches its tablets during this time of the year.